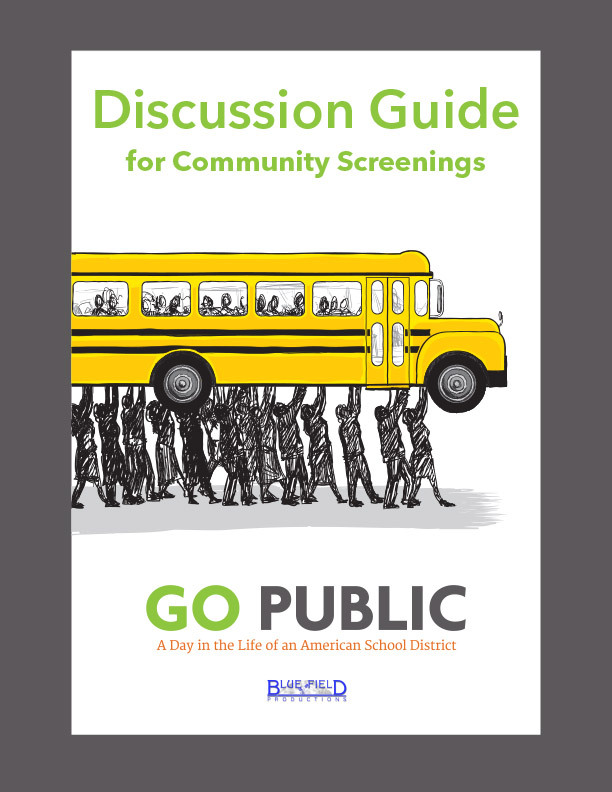 The GO PUBLIC Discussion Guides are supplements to the film that are intended to create and foster conversation. The College Guide is geared towards higher education — in particular with students who are going into the field of education. The Community Guide focuses on what public education means to us as a society — our relationships with public schools and the valuable roles they play in our communities, and our future. The GO PUBLIC film was made to raise awareness and increase understanding about the reality, not the perception, of public education and to give voice to those actually living the public school experience. The film is a window into one typical day in the life of a school district. It was made to capture an authentic look at the time, energy, expertise, care and complexity that is involved in molding and transforming students’ lives. It was made to inspire communities to support and advocate for their local public schools. Our hope is that the film will create discussion on many levels about the crucial role of public education within our communities as well as an exploration of the ways in which the system is challenged. Hopefully, these discussions will not only allow students to see public education in a new way but create an environment for solution-based thinking among future educators and others who are involved with public education. Download the Discussion Guides below.